I am looking to copy (I mean inspired by?!?) a Martyn Lawrence-Bullard room that I saw him create on Million Dollar Decorators (yup, loving the reality a little too much). 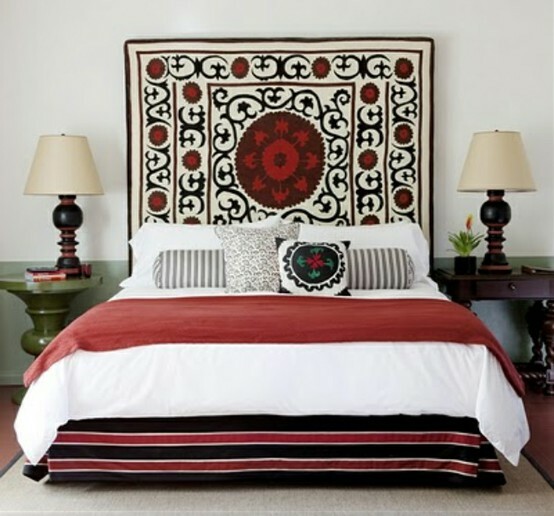 I would like this look for my bedroom with a few slight changes. I love love the colors. I am absolutely doing the walls in this shade (in case you can't tell from the photo, the walls are painted half way up with a jade green color). No chair rail, just half way painted. I love this as I think it is a traditional look with a modern twist. (Who didn't have a dining room half painted with a chair rail growing up???). My long winded question is: help me find the rest of the elements to bring the space together ala' Martyn. Linens, Curtains, Accessories. To Melissa we say: We love this. Everything about it. Deweese even used the word "obsessed" when referring to the inspiration image! So, in short, game on. 1. This beautiful vintage suzani wall hanging is handmade and pretty darn awesome. Purchase it (and other gorgeous textiles) at 30 Meeting. There are some less expensive Etsy options, too. 2. A simple classic red throw from Land's End. Red bedding always feels so cozy! We eyed this striped one, too.. and its a steal! 3. Another Land's End score. We love this throw pillow because it is a little more graphic so it creates a nice contrast to the folk art nature of the other pieces, but still feels very natural. 4. The Stinson Table Lamp from Crate and Barrel fits right in. We'd like it even more with a lighter but still natural shade. 5. So many ticking stripe bolsters on Etsy, this is just one. It was tough to find an XL one like the inspiration picture, but we think two side by side could work or you could always make one! 6. 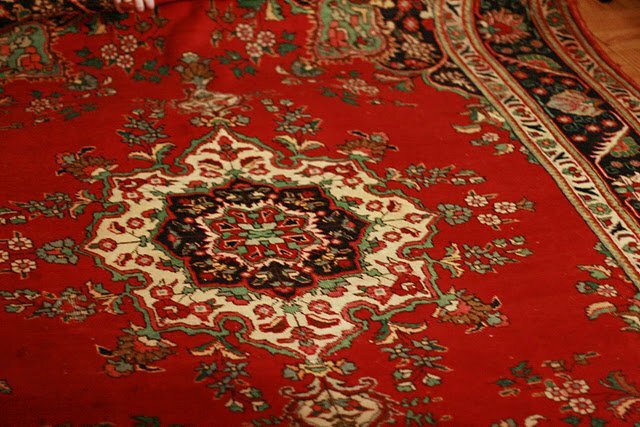 Even though the inspiration photo shows a bold, striped bed skirt, we think a cleaner/simpler version like this would look better right next to your more ornate rug. We think the piping, though, adds a nice little layer so that it doesn't look like an afterthought! 7. So there are lots and lots of suzani patterned pillows online, and especially on Etsy. We chose this one since we know you can find cheaper ones (like here or even here), but this is just way prettier, made of cotton and silk, and is handmade. 8. For curtains, we think that it would be cool to tie in some of the natural materials of the throw pillows and go a linen route for texture. With this type of curtain the feel of the room will keep it's handmade/old world feel, while at the same time, these are simple enough to not compete with the rug and other patterns. Since the walls are white/cream near the curtain rod, we think iron or other dark hardware would look great to distinguish the curtain from the wall and tie in some of the darker tones in the room. Snag it all here (the picture above is actually RH and they are silly expensive). 9. We think these crisp shams could do the exact same trick as the bed skirt: create a layer without competing and yet not look like an afterthought. We didn't source the rest of the bedding because we think it should follow the inspiration shot and just be simple white, white, white! 10. This was our lil' bonus item. You mentioned to us in subsequent emails that a chair might also be nice. We think a cognac leather, comfy, small-scale chair in a corner could be great. We love a worn look, especially with the mood in this room, so that's obviously more of a thrift/ebay/craigslist find than something we can source. Here's where you can buy the exact one above. Phew! That was fun. Hope you like and let us know how it goes! 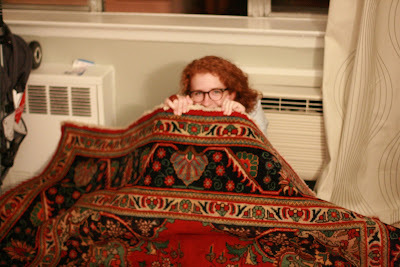 PS: A little something just for laughs... Blythe is really into Melissa's rug. Seriously. She really, really loves the rug. She might have cried had Melissa not bought it. Here's a pic to prove it! Honey.....do we have an extra $1200 laying around for a leather chair???? Love you gals, thanks for all of it.